It’s not too late to make last minute additions to your holiday wish list. 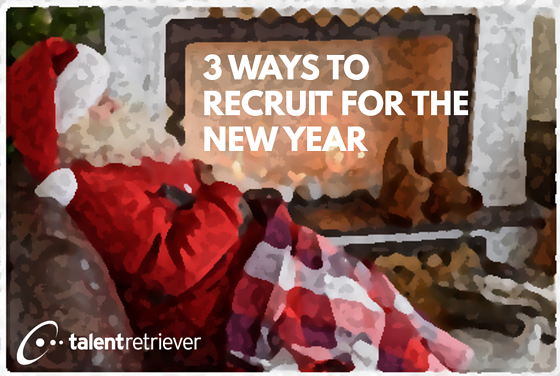 Santa hasn’t left the workshop yet – So before you unwrap a bunch of socks you won’t wear, cologne you won’t use or scratch tickets you won’t win on, how about I give you some fresh ideas for your recruitment strategy heading into the new year. Here’s 3 things you can start doing or focus on more to make sure you remain on the nice list all year long. Let’s take the buzz-wordiness of out of this and define it. At its root - a mobile recruitment strategy is how easily a candidate can find a job and apply directly using their mobile device. You know when you’re trying to do something on your phone and you say to yourself, “ehh it’s just easier to do this on a computer.” Yeah that’s when there isn’t a great mobile strategy on the other end. 70% of job seekers are using their mobiles devices when exploring career move –and almost half of them will leave a website if it isn’t optimized for mobile. So you should first determine if that’s the case. To do this visit your site on a desktop and drag the corner to see how the content changes. If the website is “responsive” it will still be readable and you can easily navigate through it. And it will be formatted correctly on any device. Also, pull out your phone and simulate what a candidate would do. Are you able to find the career page, is it arranged correctly, and most importantly are you able to easily apply? 60% of job seekers quit in the middle of filling out online job applications because they are too lengthy or complex. You can avoid this by skipping out on the annoying profile registration forms, which can be redundant when you have to then enter the same info to apply for the individual job. Also, make it easy to attach a resume using Dropbox or uploading from a google drive. If you’re website doesn’t pass the mobile test – it is a matter of working with a web developer to correct it and that should be a top priority. Imagine being able to interact with candidates, answer their questions and qualify them as soon as they are interested in an open position, without having to play phone tag or wait on an email response. Having a live chat option on the career page leads to real conversations, and conversations lead to conversions. Depending the size of the company and amount of traffic your career page receives, it might not always be a realistic option to have someone readily available to chat, in which case you can set up automatic chatbots. But if a handful of candidates per day want to talk while on your career page, those few minutes of instantly chatting with them can pay off in a big way. Tying back into your mobile recruitment strategy – you can also enable live chat on your mobile device by downloading the tool’s app. You can connect with candidates at any time and any place. Like any successful recruiter knows, you have to work around a candidate’s schedule – 9-5 doesn’t always cut it. Take your job description to the next level by creating short videos detailing the position. This is a way to have candidates meet the hiring manager and other key members of the team. The hiring manager can describe the details of the position and what value it offers a candidate and then get into qualification and you’re looking for. If a picture is worth 1,000 words, a video is worth a best-selling novel because the combination hearing from those directly in the recruiting process and seeing the environment projects an energy and excitement that can be extremely impactful. Once again tying into your mobile strategy, video job descriptions are optimal for distributing in places people visit on their devices like LinkedIn, Facebook and Instagram – after all 80% of time spent on social media is through a mobile device. Video job descriptions obviously do not replace a text description, but it is great complimentary piece. And we’ve said this before, but keep things simple. iPhone’s and other newer smart phone produce awesome video quality that are easy to directly upload to your computer.